John 17 is the longest recorded prayer of Jesus Christ, which he said right after the Last Supper. Jesus, the Eternal High Priest, is in direct conflict with Caiaphas, the Jewish High Priest in Jerusalem for that year. The Romans had taken over appointing the High Priest from the Jewish Nation, as part of their conquest, and Caiaphas was their puppet priest for the year that Christ died. Today, this would be like the President of Italy appointing a Pope yearly in the Catholic Church. Let’s take a look at these two High Priests, Jesus and Caiaphas, and how they differ. First, we know that Jesus is the High Priest sent by God from several scripture references. First, in John 6:27, it says, “Do not labor for the food which perishes, but for the food which endures to eternal life, which the Son of man will give to you; for on him has God the Father set his seal.” In Exodus 28:36, the High Priest had to wear a crown with a seal, or signet on it, which would allow the High Priest to assume the guilt of his people. Since God set His seal on Jesus, we know that He is the High Priest. Additionally, Peter, in John 6:69 called Jesus “The Holy One of God,” a reference to the High Priest from Psalm 106:16. Paul calls Jesus the High Priest many times in Hebrews, as well. Caiaphas was more of a political high priest, who thought that it was more expedient for one man to die (Jesus) than it would be to let him live and lose the whole Jewish nation to the Romans. As it turns out, his plan to sacrifice Christ in order to save their nation failed miserably, backfiring in fact, even though they did manage to kill Jesus. In 70 AD, just 40 years after Christ died (one generation), the Jewish nation fell to the Romans, thus fulfilling Christ’s prophecy that “not one stone would be left standing” in the temple in just one generation (Matthew 24:2, 34). Caiaphas even managed to violate sacred scripture by tearing his robes (Matthew 26:65) in protest of Christ’s answer to him that he was indeed the Messiah. The prohibition against tearing the robes of the high priest goes all the way back the High Priest Aaron, in Leviticus 10:6. Later on, in Matthew 27:51, as if to let Caiaphas know that the days of the old animal sacrifices were over, God ups Caiaphas’ ante by tearing the curtain in the temple from top to bottom. The Romans at the foot of the cross refused to tear Jesus’ garments, in John 19:24, which is a biblical way of letting us know that Jesus was indeed the real High Priest. 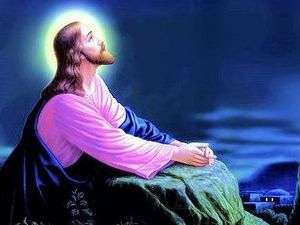 First, He prays for the glory of God to be restored – "Father, the hour has come; glorify thy Son that the Son may glorify thee.” Praying for the greater glory of God our loving Father is always a great way to start off every prayer. Second, He prays for his apostles – “I am praying for them; I am not praying for the world but for those whom thou hast given me, for they are thine; all mine are thine, and thine are mine, and I am glorified in them.” Praying for others, rather than for selfish things, is a very holy thing to do. Third, He prays for Christian unity – “Holy Father, keep them in thy name, which thou hast given me, that they may be one, even as we are one.” This unity prayer is something that is continually needed today, with so many different Christian denominations teaching so many different beliefs. Fourth, He prays for His apostles to be set apart (consecrated) as priests – “Consecrate them in the truth; thy word is truth. As thou didst send me into the world, so I have sent them into the world. And for their sake I consecrate myself, that they also may be consecrated in truth.” In Exodus 28:3, to consecrate someone meant to make them a priest, someone who is set apart from the rest of us to make intercession for our sinfulness with God. So many people don’t believe that the apostles were really priests, but here is the prayer of Jesus asking for them to be consecrated, like Aaron was in the Old Testament. Fifth, He prays for all Christians to be unified in their belief throughout the ages (including us) – “"I do not pray for these only, but also for those who believe in me through their word, that they may all be one; even as thou, Father, art in me, and I in thee, that they also may be in us, so that the world may believe that thou hast sent me.” This is a follow-up to the earlier prayer of Jesus for Christian unity. This prayer now includes everyone for all time, including you and me, and not just the apostles. Sixth, in an amazing statement, Jesus prays that He has given His glory to His apostles! This may come as a shock to those Christians who think that “God is a jealous God” and doesn’t share His glory, but that is wrong. Jesus says in John 17:22-23, “The glory which thou hast given me I have given to them, that they may be one even as we are one, I in them and thou in me, that they may become perfectly one, so that the world may know that thou hast sent me and hast loved them even as thou hast loved me.” So how can this be? How can Jesus give His glory to His apostles? The answer is that by giving The Eucharist (The body, blood, soul, and divinity of Christ) to His apostles at the Last Supper, Jesus did indeed give His glory (Himself!) to His apostles. And the great news is that everyone who receives the supernatural food (John 6:27) of the Eucharist, including you and me, receives the glory of Christ every time that we partake of the Eucharist in a state of grace. And lastly, Jesus prays that the Father and His love will be made known to the entire world. This is a wonderful thing to pray for, as God is our loving Father, not some disinterested bystander who could care less about us. It’s very apparent that Caiaphas and Jesus are two very different kinds of high priests. And thank God that we have Christ with his love for the Father and for us as our eternal High Priest, continually offering Himself in sacrifice for our sins, in the Eucharist, each and every day!